Fiona just shared me this YouTube playlist of the original Pokemon cartoon in Chinese. I think it could be beneficial for any intermediate or above learners that want to either re-live their childhood, or be caught up on the recent craze. Any infos on the “catch em all” lesson, when is it gonna hit the shelves? We are scripting a new lesson as I upgrade my Eevee (I’m trying to collected all three evolved forms). It will probably come out next month, but I’ll ya’ll all posted. If you name them Rainer, Pyro and Sparky before evolving you will get Vaporeon (水伊布), Flareon (火伊布) and Jolteon (雷伊布), respectively. Thanks so for that tip. I’ve got Jolteon so far and waiting to upgrade another to a Vaporeon (coz it just reminds me of my cat so much lol). Here’s a new lesson all about Pokemon Go. Today we're taking on the controversial topic of Pokemon Go. 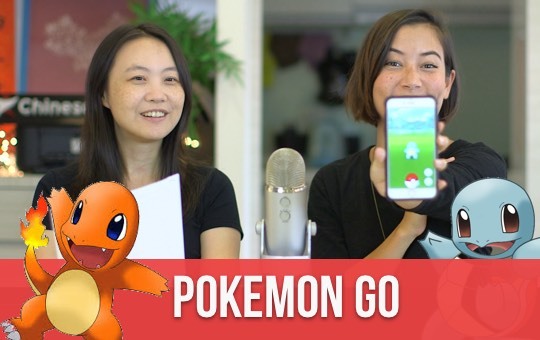 Learn the names for popular Pokemon, hear about the stampede in Beitou, and hear some pro's and con's about the game. For another video lesson with some Pokemon in it, click here. Yeah it looks like they’re being taken down. Try searching 神奇寶貝 on your favourite video site. about bears.Easy to understand check this one out guys. Thanks for the suggestion. Nice and HD and lots of episodes on YT.